Make a nourishing broth in your instant pot with your choice of chicken, pork, beef, turkey and a combination of nourishing vegetables. 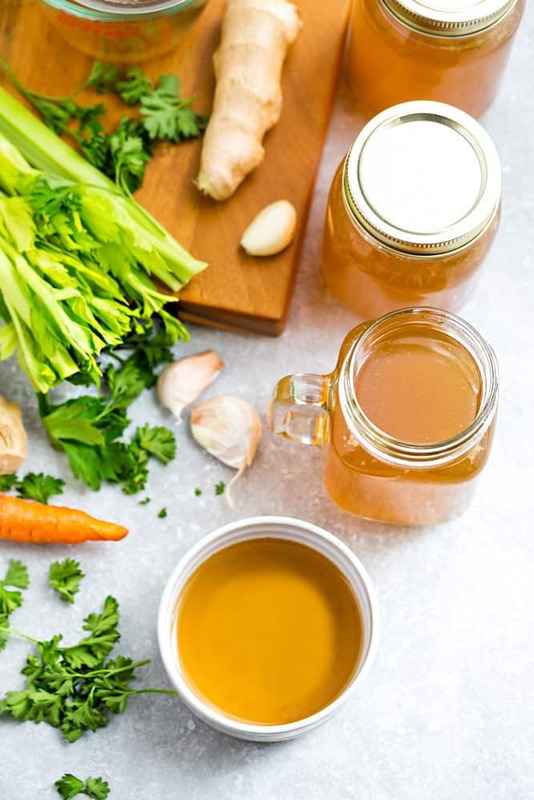 Bone broth has always been a staple when we were growing up. My mom is a soup fanatic and would always make a big pot at least 3-4 times a week to make soups, stews, stir-fries and sauces throughout the week. 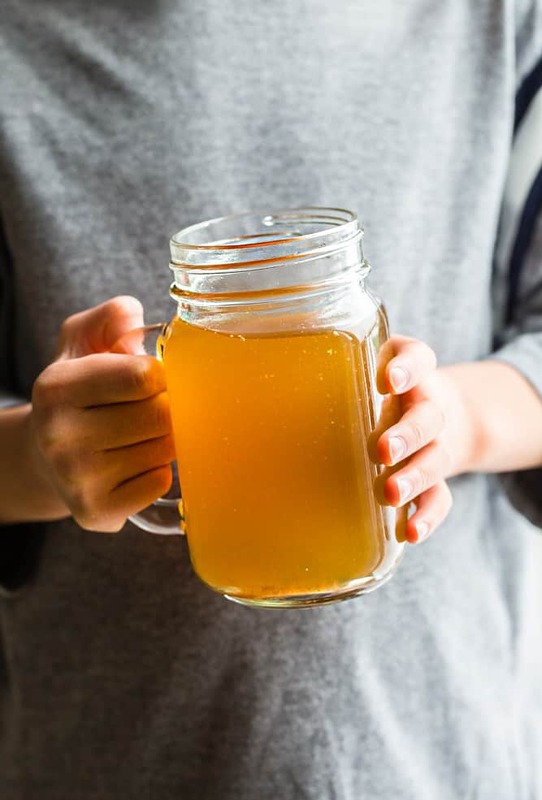 Bone broth has gained rapid popularity recently due to the many health benefits it brings. I now make a batch of Instant Pot Bone Broth at least twice a week. It’s seriously the best natural medicine for SO many ailments. It’s gluten free, whole 30 compliant, ketogenic friendly and I mention HERE how it helped to heal me after a severe allergic reaction. 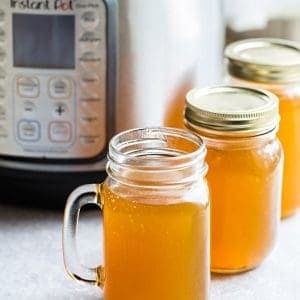 HOW DO YOU MAKE INSTANT POT BONE BROTH? Use any combination of chicken, turkey, beef, or pork bones. Fish bones are also great for making fish stock. For extra depth of flavor, roast your bones for 1/2 an hour at 350 F.
Add 1 teaspoon of raw apple cider vinegar or lemon juice to help break down the bones. 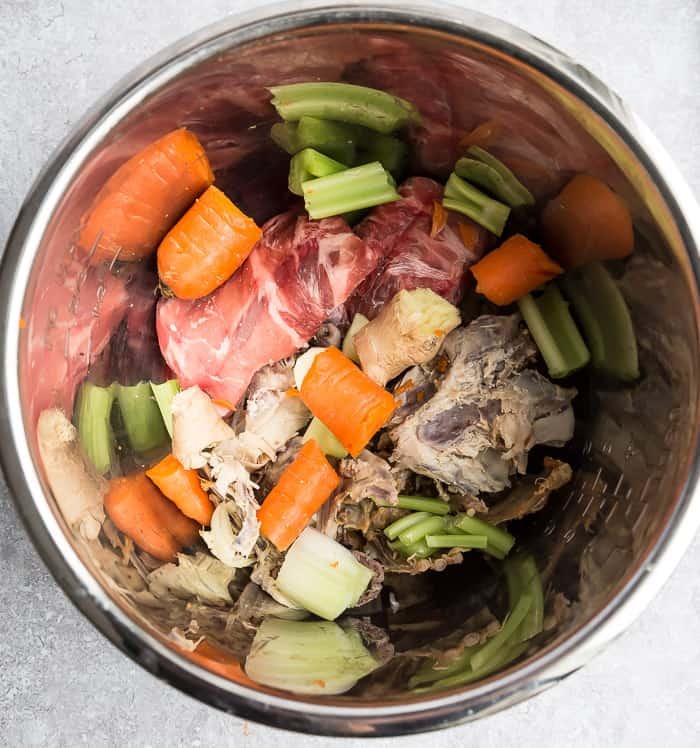 You can save your veggies scraps throughout the week and freeze them for when you’re ready to make a batch of this Instant Pot Bone Broth. Just toss everything into your Instant Pot and you’re good to go. 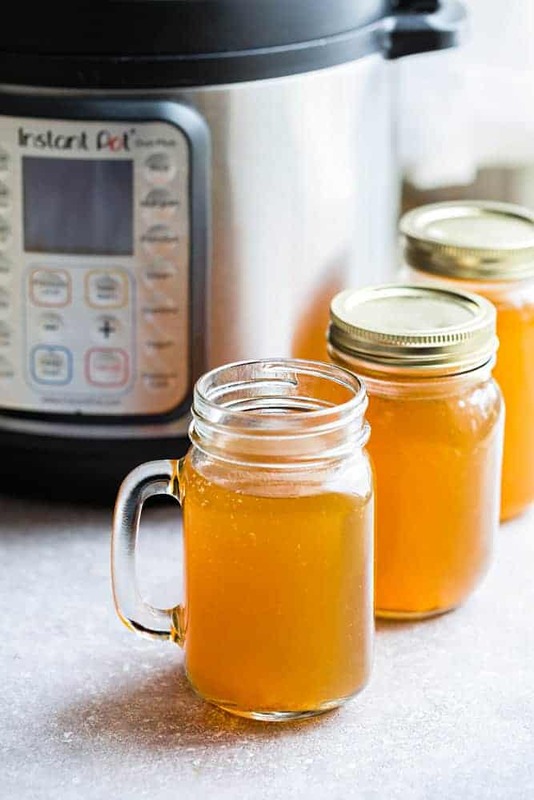 What’s great about making Instant Pot Bone Broth is that it cooks in just a fraction of the time and is just as flavorful – if not more. Just 2 hours on HIGH PRESSURE and you’re left with a batch of awesome bone broth that you can store in some mason jars in the the fridge for the week. 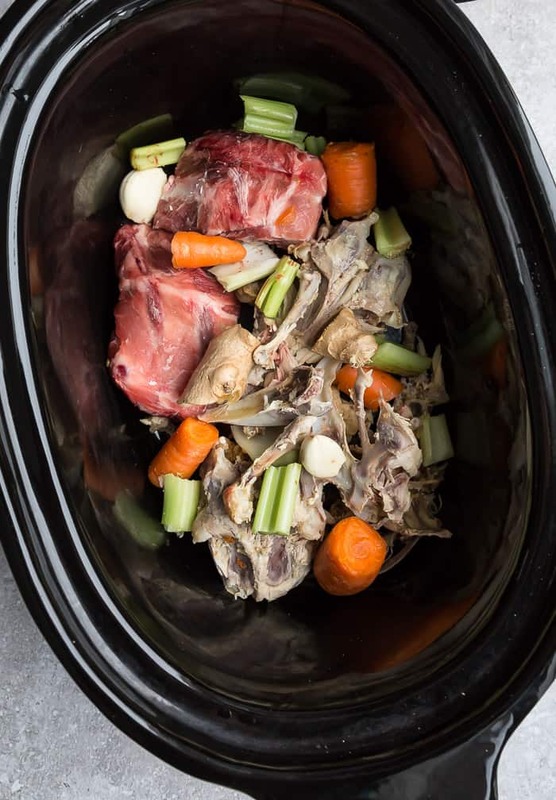 I’ve included instructions for making this bone broth in the slow cooker and on the stove-top as well. If making it on the stove, you’ll have to simmer for at least 8-12 hours (ideally 18-20 hours) for extra flavor and to bring out all the nutrients. Enjoy your Instant Pot Bone Broth as is or use it to make soups, stews and add flavor to sauces and stir fries. The best part of this Instant Pot Bone Broth recipe is that homemade bone broth is perfect for this time of year. It’s full of valuable nutrients that help you recuperate and speed healing from illnesses like a cold or the flu. 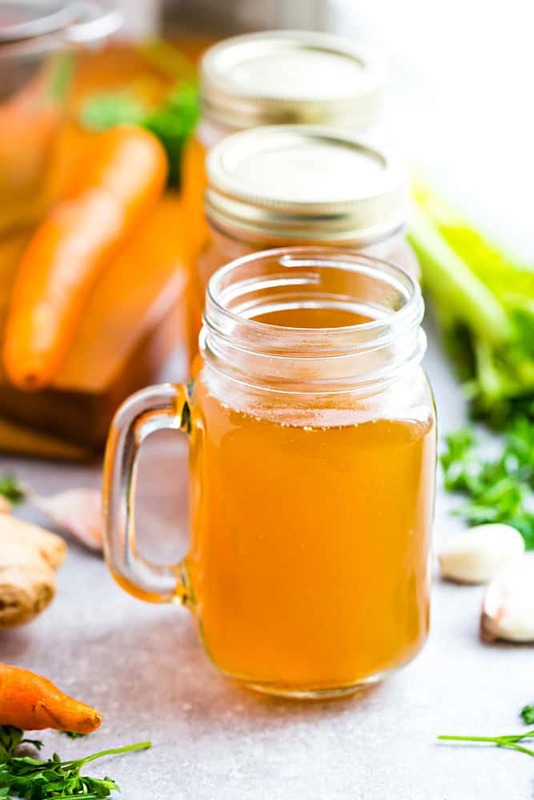 Instant Pot Bone Broth – tips on how to make the perfect nourishing broth. Best of all, easy to customize using your Instant Pot Pressure Cooker, slow cooker or on the stove. Made with your choice of chicken, pork, beef, turkey and a combination of nourishing vegetables. For extra depth of flavor and to cut down on the fat rendered from the bones, you can roast them on a baking pan in the oven at 450 F for 30 minutes prior to making the broth. Place all the bones in the inner pot of the Instant Pot. 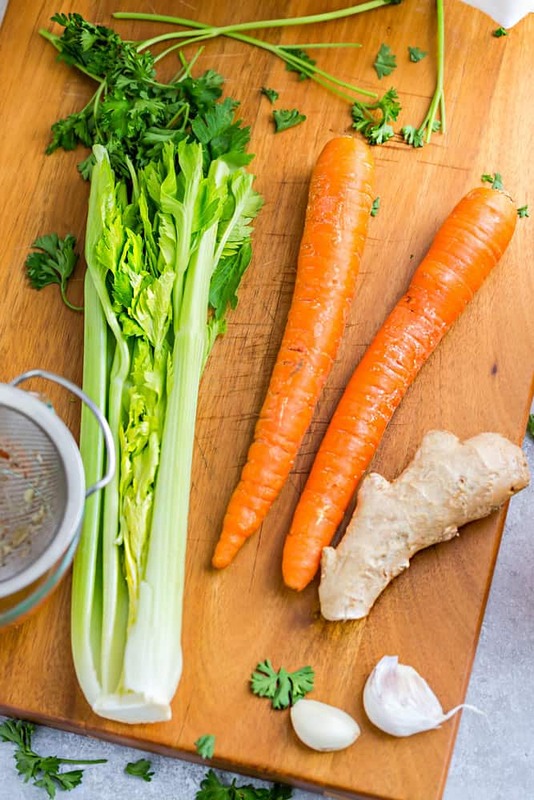 Add carrots, celery, ginger, garlic, and apple cider vinegar. Add enough water until the pot is 2/3 full. Close the lid and turn the valve to SEALING. Press the SOUP button and increase the cook time to 120 minutes. Allow the Instant Pot to come to pressure - this can take about 20-40 minutes. After the 120 minutes when the soup has finished cooking (the Instant Pot beeps), allow to naturally depressurize (this can take anywhere from 30-60 minutes. Open the lid, add salt to taste and parsley, if using and allow to sit for 20-30 minutes. Strain the broth through a fine metal strainer and discard the bones and vegetables. Enjoy immediately or allow to cool and pour broth into jars and store in the fridge up to 5 days or freeze for up to 3 months. Place bones in a large dutch oven or heavy bottomed pot. Pour water over the bones and add the vinegar. Allow to sit for 20-30 minutes (helps to bring out the minerals from the bones). Add carrots, celery, ginger, garlic, and apple cider vinegar. Turn the stove to high heat and bring to a vigorous boil. Reduce heat and allow to simmer for 8-10 (to really get the health benefits of bone broth - simmer longer for 18-22 hours). Using a skimmer or spoon, remove and discard any impurities that float to the surface. During the last 30 minutes, add salt to taste and parsley, if using. Place bones in a 6 quart or larger slow cooker. Pour water over the bones and add the vinegar. Allow to sit for 20-30 minutes (helps to bring out the minerals from the bones). Cook on low and cook for 12-18 hours (to really get the health benefits of bone broth, simmer longer for 18-36 hours). Add salt to taste and parsley, if using the last 30 minutes of cooking. I use an assortment of chicken, pork or beef bones that I gather and freeze throughout the week - a whole roasted chicken, bone marrow, knuckles, cross shanks , oxtails, neckbones and short ribs would all work. Is it possible to can this? I’ve been doing my bone broth on the stove top or in the slow cooker for years now. (I really only do it in the summer, but supplement with collagen peptides year round.) Now I keep hearing about this Instant Pot, and it’s sounding more and more tempting!